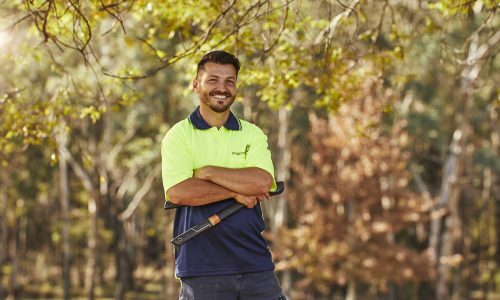 From foreign exchange to landscaping – how Max found a work/life balance and turned his landscaping hobby into a booming business. Some milestones in life can prompt a change in career. For Max Turkkan at My Garden Care, it was his growing family. In this Q&A, he shares how he made the leap from trading currencies to designing landscapes on million dollar properties. Q: How did My Garden Care get started? My career started in a typical office. I was a foreign exchange trader working 12-14 hours days, 5 days a week. The days were long and inflexible. It wasn’t until I had my first kid that I decided to choose a different career path. I needed something that allowed me to spend more time with my growing family. I always had a passion for landscaping and gardening and flowers, it was something that people said I was naturally good at. So, I took a leap of faith, quit my job and started My Garden Care. To get more business in the door, I did my research and learned about building a website. If you don’t have a website, you’re living in the past. You’re a dinosaur. In my research, I found Netregistry, which was an Australian based company, and met Chris (Dixon). We set up the website for $99/month and from there I had a business. Q: What was it like to start your business? It was hard at first. I was thinking, did I make the right decision? I was thinking of ways to market my business. There was no transition between two jobs. I just had enough of corporate life and I valued my time. Money comes and goes, once time goes, you can’t get it back. It took 8-12 months for the business to take off. It’s a competitive industry because people have choice. I tried social media myself, but it comes down to time. I was trying to do tech while I tried to grow my business. At first it was very hard. No one knows you. You can only go by your sales and how well you sell yourself. That’s why I think a really good website can sell you 100% better than me talking. First impressions last, when people click onto my website they’ll think, this guy knows what he’s doing. If a client likes your website, you’ve got the key to the door. Q: If you were to do three things over again, what would they be? I wouldn’t listen to friends and family. They were hesitant about me quitting my job with a growing family. In the end, I listened to my gut and just did it. If I were to do it all over again I would make decisions a lot quicker. I was working 12-14 hours a day and bringing work home. I wasn’t enjoying family life. I should have quit earlier. I would find a mentor, someone in the same business. Mentors have the right answers for the industry. Half the time I was winging it. If I were to start another business, I’d find a mentor in the industry and ask them a lot of questions. Invest in education (i.e. horitcutulre or landscaping). I’d upskill and educate before I get busy. It’s a little too late for me now. Even if I were to do a course, I’d have to do it at night. Q: What advice do you have for those starting a business? Just do it. The longer you leave it the longer the flame inside you will get smaller. Take the risk. Sometimes risk can pay off big time. Family comes first but in business, clients are the blood in your veins, the life support in your business. With business your clients come first. Take the extra mile. I don’t do it for credit. I do it to make sure they’re happy with the results. They may only want a small job but you never know what they’ll need tomorrow. Be smart with your money. You’re just starting off and need capital to get the ball rolling. You don’t want to be pushing the ball uphill. If you’re borrowing money from people, be smart. I’ve heard people buy a new van or fancy stuff before landing clients. I’ve had the same Ute for 7 years, it’s the Ute I started with. Save your working capital. Do your homework. You have to look for multiple suppliers. You need to look online, visit wholesalers depending on the industry you’re in. There’s always a better deal out there. Don’t get complacent. As Max says, there’s no better time to get started. Whether you’re looking to launch or grow your business online, we can help. Ask our team of Online Solutions Advisors about our Done For You Websites or online marketing.